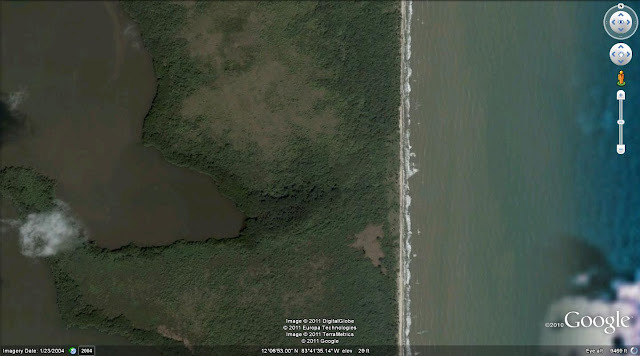 FALSE BLUFF NICARAGUA: Where the hell is False Bluff? Where the hell is False Bluff? An uninterrupted stretch of beach runs just a bit more than twenty-six miles from El Bluff on the edge of Bluefields Bay north to Pearl Lagoon, or Laguna de Perlas. Along this stretch are a few small farms, or fincas, none of which are occupied full time; and my place, False Bluff. Access to properties all along this stretch has always been a problem. You can go by way of the Caribbean; or you can go through swamp. 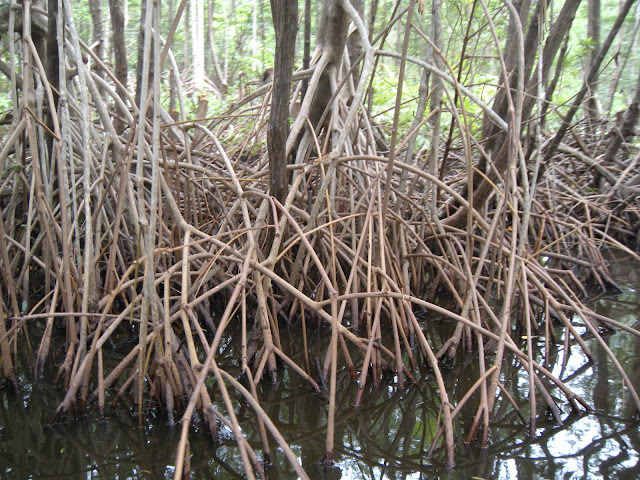 Mangroves line the inland edges of this twenty-six mile stretch, all varieties of which are invasive. Perhaps hundreds of years ago there were only one or two 'tiers' of mangroves at the water's edge; now there are countless 'tiers' that have, over time, walked from the land into the water. Seedlings sprout and do what their parents do: send down roots. Spaces among the roots fill up with leaves and wildlife providing a beautiful haven that makes for wretched and time consuming travel. My property sits on one of the narrowest pieces of land along the stretch between El Bluff and Pearl Lagoon. But even better, my property is bisected by a creek that flows into Smokey Lane Lagoon from its head near the beach. When I bought the property, however, the creek had been devoured by trees and was impassable by boat. After making several trips to False Bluff through the swamp, my first project was going to clean up the creek enough so I wouldn't have to do it again.